We’ve reached a point where new data breaches are announced on what seems like a weekly basis. It’s almost impossible to keep up with all the breaches and your password situation, but a new Chrome extension from Google is here to help. The extension, simply called Password Checkup, monitors your login credentials (usernames and passwords) and then lets you know if they’ve been part of a data breach. Simple enough. Password Checkup was built with privacy in mind. It never reports any identifying information about your accounts, passwords, or device. We do report anonymous information about the number of lookups that surface an unsafe credential, whether an alert leads to a password change, and the domain involved for improving site coverage. 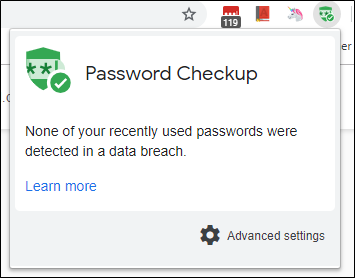 You can learn more about how Password Checkup works at https://support.google.com/accounts?p=password-checkup. Once installed, you just need to let it do its thing. It will run in Chrome and let you know if something is wrong. You can also give it a click just to make sure everything is okay if you want, but a simple glance should let you know everything you need to know.